Birthplace : Buffalo, New York,U.S. Gregory Wayne Oden, Jr. (born January 22, 1988) is an American basketball player at the center position who is currently a free agent. Oden played basketball for Ohio State University for one season, during which the team was the Big Ten Champion and the tournament runner-up in the NCAA Men's Division I Basketball Championship. On June 28, 2007, Oden was selected first overall in the 2007 NBA Draft by the Portland Trail Blazers. He underwent microfracture surgery of the knee in September 2007, and missed the entire 2007–08 NBA season as a result. He recovered and made his NBA debut on opening night 2008. On March 15, 2012 he was waived from the Trail Blazers after a long history of injuries. Oden is currently the "Team Oden" spokesperson for Oregon Mentors, promoting mentoring for kids. 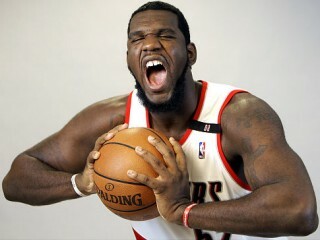 Although picked first overall in the 2007 NBA Draft, Oden was classified as a rookie for the 2008–09 season because of the knee injury.Entering the 2008–09 season he was listed at 250 lb (110 kg), but according to Blazers' trainer Jay Jensen he weighed about 290 lb (130 kg) in July. Oden left his NBA debut with a foot injury after playing thirteen scoreless minutes against the Lakers. He returned on November 12, 2008 after missing two weeks, and scored his first NBA points in the first quarter against the Miami Heat. On January 19, 2009, Oden went for a career-high 24 points while also grabbing 15 rebounds in a 102–85 win against the Milwaukee Bucks. On February 13, 2009, he injured his left knee in a game against the Golden State Warriors, by bumping knees with opponent Corey Maggette, and missed three weeks due to a chipped knee cap. On November 23, 2009, Oden matched his career-high for points in a game again with 24. He set a new career-high for rebounds in a game with 20 on December 1. On December 5, 2009, Oden injured his left knee in the first quarter of a game. He was taken off the court on a stretcher. Later, he underwent surgery for a fractured left patella and missed the rest of the season. That injury marked the second time Oden had missed major playing time due to injury. On November 17, 2010, the team announced that Oden would have microfracture surgery on his left knee, ending his 2010–2011 season. The injury marked Oden's third NBA season cut short due to a knee injury. On December 9, 2011, the Trail Blazers announced that Oden had suffered an unspecified "setback" that left them less optimistic about his ability to play in the 2011–2012 season. Rather than signing an 8.9-million-dollar qualifying offer, Oden and the team negotiated a different offer. On February 3, 2012, Oden underwent arthroscopic surgery on his right knee. On February 20, 2012, Oden was scheduled for a procedure on his left knee similar to the procedure he underwent 17 days earlier. However, during the operation, further damage to the articular cartilage was discovered, and Oden underwent his third micro-fracture surgery. Playing 82 games in his entire career so far, he has effectively played one full NBA season over the span of four years.On March 15, 2012, Oden was waived by the Blazers in an effort to create room on the roster for trade acquisitions. View the full website biography of Greg Oden.